Despite the continuous rise in interactive and digital toys, traditional toys are still here to stay. A lot of parents even prefer that their little ones play with basic playthings instead of getting all slack-jawed over technology at an early age, mostly because traditional toys encourage creativity and development of motor skills. When it comes to babies that are already starting to develop some leg strength and beginning to move around independently, I always recommend pull toys. They perfectly combine interaction, imagination, and physical movements, creating great play times without hampering a child’s growth. They’re must-haves in my opinion, as they can really help your child in so many ways. They help refine motor skills. They can help improve your little one’s coordination. They can help boost your child’s problem-solving skills. 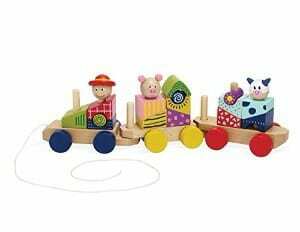 Pull toys give toddlers a fun physical activity. The correct timing is essential. They’ll need some encouragement to get going. Be wary of the pull string. Parental supervision is always recommended. Walking the dog is a common chore among pet parents. This can be one of the most identifiable uses of pulling among toddlers as they may have already seen you or other people in the park with their pups on a leash, so it shouldn’t come as a surprise that a toy dog would be a common pull toy motif. 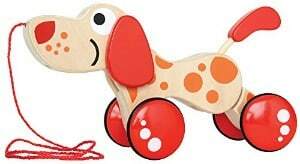 This makes Hape’s Walk-A-Long Puppy Wooden Pull Toy a popular option, as it features an adorable puppy in vibrant orange and red colors. What's Great About It: Since it is small, it’s the perfect tiny companion to a toddler who’s still learning to walk. It also has rubber-rimmed wheels to minimize noise and cushion its roll. I also love its articulated legs and neck, which make it more realistic and perfect for pretend play. If your little one loves learning about reptiles and animals that aren’t always found nearby, the Dancing Alligator of Plan Toys can be a solid choice. Being a cute version of an alligator, this wooden pull toy makes the creature less threatening to young kids as it “dances” because of its connected design. It also creates a clicking sound as it moves, providing an additional sensory element to your child’s playtime. What's Great About It: Made from the wood of dried-up rubber trees, this toy also takes pride in being recycled. With the manufacturers’ effort to reduce waste by reusing and reducing what would have been considered waste, they get to create eco-friendlier toys that are not only good for the environment, but enjoyable for kids as well. Small, cute animal toys are not just playthings for most young kids, but they also serve as occasional playmates as well. This makes the Cheese Squad Racers by Tomy a perfect option for lots of kids, as this toy features not just one animal, but three cute mice riding a three-seater soap box derby car that makes a fun clacking sound as it moves. What's Great About It: Each mouse is removable, so your child has more ways to interact and play with the elements of this pull toy. They also move up and down in their seats while the toy is in motion. Add to these features the fact that it makes a distinct sound that will also engage the auditory senses of your little one, and you have a truly engaging pull toy in your hand. 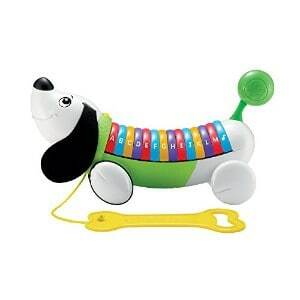 Incorporating an interactive aspect to a traditional toy, the LeapFrog AlphaPup is a pull toy and a talking puppy all in one. This toy looks like a cute beagle with soft ears, a wagging tail, and paw-shaped wheels, but it is also very modern with a series of pressable keys with a corresponding alphabet letter to it. Your child will not only enjoy pretend play with this toy, but will also get to learn his ABCs while she's at it. What's Great About It: Aside from its interactive keys, the AlphaPup also sings the alphabet while in motion. This will not only keep your little one entertained with her senses highly stimulated, but it can also help her retain the knowledge more easily. I'm also a big fan of the large bone-shaped plastic handle attached to the string. This makes the toy more attractive, but also ensures your little one’s safety. Another pull toy that you can get from TOMY is the Quack Along Ducks. Great for kids who love birds and maybe feeding the ducks at your local park, this toy features a mama duck and two ducklings trailing behind. 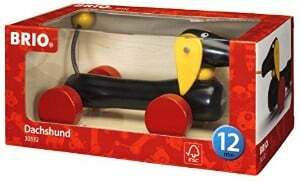 What's Great About It: This battery-powered pull toy quacks along (as the name suggests) as it moves. This makes it really entertaining and sense-stimulating because of its vibrant colors and amusing sounds. 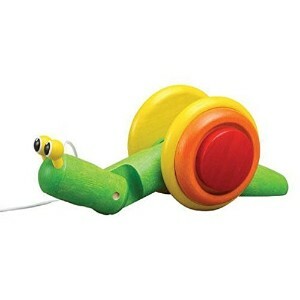 Toddlers who are interested in creepy crawlies in the garden will love Plan Toys’ Pull-Along Snail. Designed to replicate one of the gentlest creatures in your backyard, this toy will capture your toddler’s heart with its friendly look, vibrant colors, and eye-catching movements. 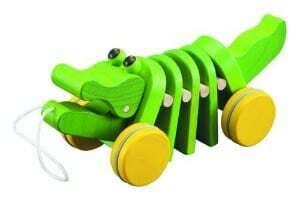 What's Great About It: Made from recycled rubber wood, this toy is very eco-friendly. I also love its funny movements, as I'm sure that young kids will enjoy watching it roll around. With a solid reputation in the toy industry, I can’t help but like the Brilliant Basics Lil Snoopy from Fisher-Price. As it features a cute cartoon version of an adorable pooch, it might just be a great choice for your tiny tot’s first puppy. What's Great About It: I particularly enjoy the wheel design of Lil Snoopy, as the legs are designed to go up and down as the wheel rolls, so it looks like the pup is crawling forward. Its cartoony appearance also makes it great for pretend play, teaching your child the basics of handling and walking his own dog. 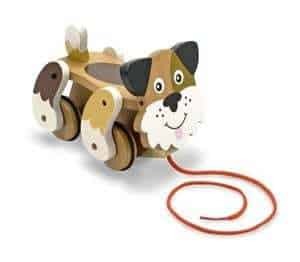 If you're on the fence about a plastic pull toy, Melissa & Doug’s Playful Puppy is a nice alternative to the Lil Snoopy, as it is made from wood, but has the same concept of making the pooch’s legs move as the toy rolls forward. Since it is cute and rolls around with ease, this small toy will surely bring loads of fun play times for kids who are just starting to walk. What's Great About It: With the legs attached directly to the wheels, your child can watch her toy move just like an actual dog would, making it great for imaginative play. If you want to get more out of your child's pull toy, Hape’s Shape Sorter Turtle is a lot more than just your typical wooden pull toy, as it also has a built-in shape-sorting game right inside the turtle’s shell. 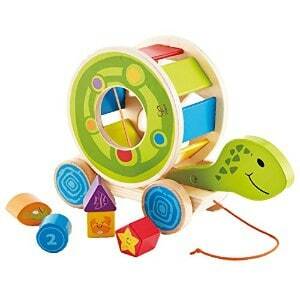 This colorful toy will keep your little one occupied and entertained for hours on end. What's Great About It: Aside from its attractive appearance, the fact that this toy is designed to be a shape sorter toy as well adds more functionality and value to it. Your child will be able to use it for much longer and it can help stimulate his brain in more ways than one. Best known for its interactive toys, it shouldn’t come as a surprise that VTech’s take on the traditional pull toy is packed with many functionalities and ways for your little one to learn and enjoy. Patterned after a car carrier truck, this toy won’t just entertain your toddler, but it will also teach her about numbers and nursery rhymes, as well as fuel her pretend playtimes. What's Great About It: With three interactive animals and three interactive vehicles, a CB radio, a flip-down ramp, and a pull toy truck, this toy definitely offers a lot to a young child. It’s a traditional and educational toy in one fun package that is designed to stimulate your little one’s brain development and senses. If you're looking for a minimalist option to help foster your little one’s imagination, Brio’s Pull Along Dachshund is a product you should look into. This toy is a no-frills wooden toy in the shape of a dachshund, and it can be the perfect companion for your young toddler. It’s not overly simplistic, though, as its tail wags (thanks to its spring) and its head turns. The dog’s body moves up and down, as well, as it rolls forward, so it promises to be very entertaining, despite its fuss-free design. What's Great About It: I love the striking color combination in this toy, as it looks modern, sophisticated, and stylish, but also traditional at the same time. 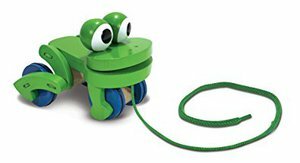 Another cute pull toy option is the Frolicking Frog by Melissa & Doug. This wooden toad toy is very fun to watch, as it mimics the hopping movements of a frog. With its hind legs moving up and down as the wheels roll, it looks like it’s leaping forward as your child pulls it around. What's Great About It: There’s no denying that its design is this toy’s strongest suit. It will surely play a huge part in a lot of your child’s roleplaying games. Another multifunctional pull toy, this set from Manhattan Toy features a tug-along train that is also a set of building blocks. The play options with it are unlimited, as your child can pull it around, make it roll around, stack its component in different ways, and configure it in so many different styles. What's Great About It: Being a pull toy and block set at the same time, this product will not only help develop various motor skills in its players, but will also train their spatial and problem-solving skills as well. 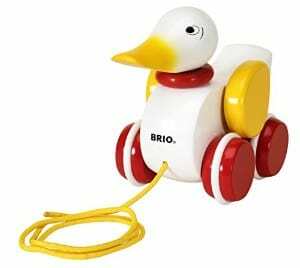 Another minimalist option from Brio is its Pull Along Duck Baby Toy. Like the Dachshund, it may be simple-looking, but it’s actually very visually appealing, as its head turns from side to side and its wings roll around as well. What's Great About It: I love its vibrant colors, which will surely captivate a young child. The simple movements it makes are also great for stimulating a young child’s senses, curiosity, and imagination. With its eye-catching design and interactive components, Melissa & Doug’s Pull-Along Zoo Animals will excite any animal-loving toddler. This toy will let them have three zoo creatures (elephant, zebra, and giraffe) in one package, adding more characters to their pretend play games. What's Great About It: The vibrant colors and variety of animal characters will keep your child entertained and engaged with this toy. I also love that the three animals are easy to pull apart, so your child can also play with them individually. 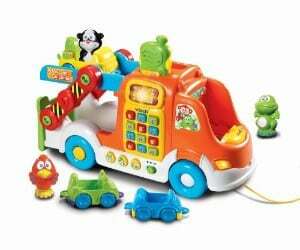 Pull toys are some of the most commonly recommended playthings for toddlers who are just getting the hang of walking. Adults may not exactly see the fun in pulling something around, but when seen from the perspective of a growing child, it can be a challenging toy that will bring hours of fun. Pulling is actually a more complicated task for young children. They’ll learn how to push first, before they get to learn how to pull things while walking. Pushing can be pretty easy for kids, especially those who learned how to walk with a push walker. The fact that they have something else to support their weight with makes pushing quite simple for growing babies. Pulling, on the other hand, requires a certain sophistication of their motor skills before they are able to do it successfully. 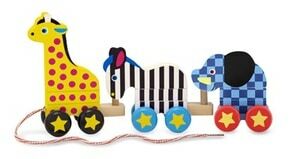 Pull toys are very useful in refining a toddler’s gross and fine motor skills. The fact that they have to grasp onto a string and apply a specific amount of force to pull their toy along can really target their muscles to function and get used to certain movements. There’s also the constant looking back and having to position their arm nicely to pull the toy more easily, which will really get their muscles working. As pull toys also require your child to walk around, their walking skills and core balance are trained as well. Without a doubt, pull toys are very physically demanding toys for young kids. They may not be as exhausting as other games or equipment, as your child always has the choice to stop pulling if he's already tired. However, they can still give your baby’s little muscles a nice workout and training from time to time. Eventually, with the help of their regular pull toy playtime, your child will be able to master a wider range of movements. Pull toys are very simple to work with. All your kid has to do is pull on a string, and her toy will come to life. It’s an excellent tool to further develop young kids’ understanding of causal reasoning and that what they do can have an effect on something else. Causality is something that small kids will love to discover on their own. It will give them a better understanding of how things work, which they can then replicate on other objects. It can help boost their self-esteem and make them feel accomplished every time they repeat the action. It can also let them predict how things will turn out if they do something, which will give them more knowledge about the world around them. As mentioned before, pull toys can be quite complicated for little kids. This is because their body parts aren’t well-coordinated just yet. By letting them play with a pull toy, they’ll learn the basics of multitasking: pulling while walking and keeping their toy upright can be a challenge that they’ll be very engaged in and be successful with. They’ll need to use their arms, legs, and eyes all at the same time when pulling their toys, so they’ll have to find a way to balance it all out. It won’t be easy, but it will be thrilling for a young child who is just learning how to do things for the first time. 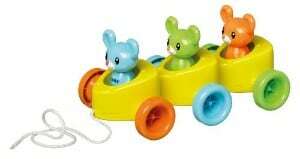 The fun part about pull toys is that your little one can make up scenarios to make his playtime more exciting. It helps that a lot of these toys come in engaging designs and replicas of actual things that people tug around. Imagining scenarios will be very easy for your little one, and they can quickly take on different roles. This will help your child conjure a new world of his own, where he's walking the dog (or another animal), cleaning the yard, or helping a vehicle move along. It’s a great way for them to engage in pretend play, which will then help develop his language, thinking, and emotional skills. When playing with a pull like a tow-truck, your little one will surely face different obstacles. Getting around these hindrances will help your child tackle different kinds of problems and challenges that can stimulate her brain. This will then boost your child’s curiosity, patience, and flexibility. It will also help develop her thinking skills and teach her how to work to achieve a goal. All of the walking and pulling will give your child a good amount of exercise, which is necessary, even for babies. Pull toys can easily help fill up the recommended three hours of physical activity for toddlers. Pull toys may be perfectly simple, but that doesn’t mean that they don’t do anything for your little one. All of these benefits prove that they’re worth your precious one’s time, so getting one or two of them will surely be a great thing. Maneuvering a pull toy won’t be very natural for your little one at first. They’ll have to position their arm behind them and apply the right amount of yanking force to make their toy move. They’ll also need to look back to see their toy, which can be quite frustrating for a young child that’s used to dealing with things in front of them. Doing this requires a good deal of balance for your little one. This is why introducing these toys to your child at the right time is essential. Your child needs to be steady and secure with his footing first before he can move around pulling something. 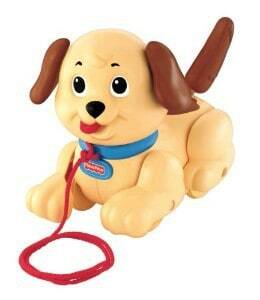 If he's just started to walk, it’s best to wait a few months more before giving him his first pull toy. Introducing pull toys to kids can be a bit tricky. You can’t just expect your child to know what to do with her new plaything if she's never encountered one before. A little demonstration will do, though, especially since toddlers love to copy the things their parents do. Pull the toy around for some time, and then give it to your little one to try. If she manages to replicate your action, then she's already fully ready to play with one. However, there will be some instances where she'll find it very difficult to pull and walk at the same time. While toddlers are less at risk of strangulation and cuts from strings, it’s still best to be very wary of anything that can potentially put your little one’s health at risk. The American Society for Testing and Materials (ASTM) F963-86 states that pull toys with strings that are longer than 12 inches shouldn’t have beads or other attachments that can make a loop. Experts believe this is so it won’t lock around your little baby’s body, causing harm or injury of any kind. As your child is still getting used to his footing and balancing when he first starts playing with pull toys, you should always keep an eye on him while he plays. Toddlers will truly benefit from playing with pull toys. Luckily, there are tons of options to choose from, so you can be sure that you’ll make a good pick with some ease. Hopefully my top picks also help you out in finding the right match for your toddler so she can quickly enjoy the benefits of these wonderful toys.